Aloe Freeze Gel Review: Does This Really Help To Remove Fine Lines? This Aloe Freeze Gel Review will provide you with the information you need to determine whether or not this soothing skincare treatment can really hydrate, calm, and soften the skin as it diminishes the appearance of fine lines and wrinkles. Australian Gold Aloe Freeze Spray Gel isn’t your average aloe vera skincare treatment. This product hydrates the skin and prevents dryness and irritation after prolonged sun exposure. This soothing product also diminishes the appearance of fine lines and wrinkles caused by the sun’s harmful rays and dehydration. With continued use, your skin will appear smoother, softer, and hydrated. For best results, apply Australian Gold Aloe Freeze Spray Gel to your cleansed skin. Focus on areas of the body that have been burned or dried out due to prolonged exposure to the skin. You may reapply this product as needed. Be sure to apply an SPF of at least 30 during the day to prevent further damage from occurring. Australian Gold Aloe Freeze Spray Gel retails for $9.94 per 8.0 fl. oz. of product on several very well-known, trusted drugstore sites. Spearmint: This ingredient provides the user with a tingling, cooling sensation upon application. Australian Gold is a well-known, trusted skincare brand. This product cools the skin and soothes sunburns. This skincare treatment hydrates the skin and prevents fine lines and wrinkles from forming. This skincare treatment contains synthetic fragrance and artificial coloring, which may cause irritation. This product contains menthol, which may feel good temporarily, but will likely cause irritation with prolonged use. Australian Gold Aloe Freeze Spray Gel claims that it can sooth the skin and prevent irritation that’s been caused by prolonged sun exposure and even diminish the appearance of fine lines and wrinkles. Although this may sound like the perfect way to sooth your skin after a long day out in the sun, there are several issues we think you should consider. This product contains several problematic ingredients in the form of fragrance, artificial coloring, and spearmint Together, these ingredients can cause severe dryness and irritation, which completely negates your reasoning for using such a product. Spearmint may cause a pleasant cooling and tingling sensation upon application; however, ingredients such as these will likely cause more irritation in the long run. We’d recommend continuing your search for a skincare treatment that doesn’t contain any unnecessary irritants. 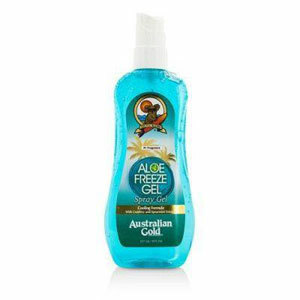 Australian Gold Aloe Freeze Spray Gel is available for sale on several reputable drugstore retailer websites. These sites have very reasonable return policies. If, for any reason, you’re unhappy with the product you’ve chosen, simply return it for a full refund. Be sure to include proof of purchase, otherwise you may receive store credit in lieu of a refund.